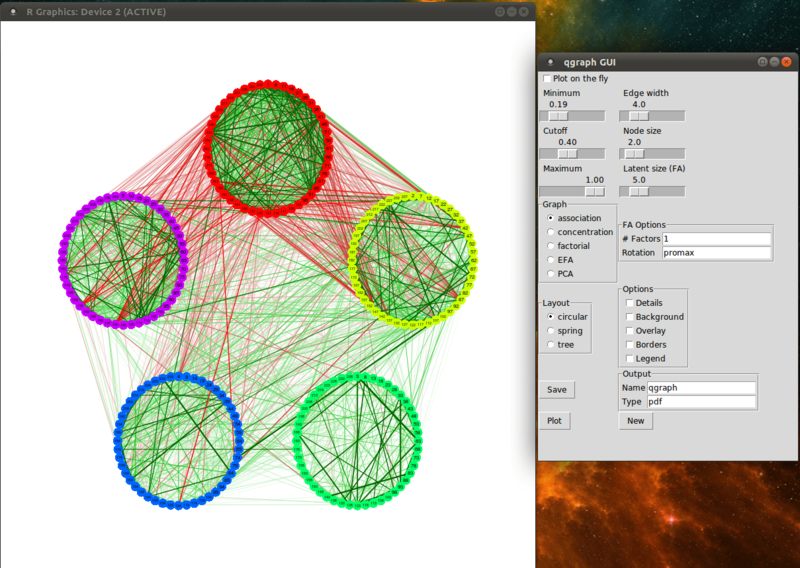 There is also a simplified version of this GUI for regular graphs (not correlation matrices). What I particularly like about this GUI is that it took me only one day to implement. Making a GUI for qgraph has been on my to do list for a long time, but I never really got to learning how one of the packages that allow this work. When I found out about the ‘rpanel‘ package (which is build on ‘tcltk’) I was pleasantly amazed with how simple and intuitive it was to use. In short, the way ‘rpanel’ works is by making a ‘panel’ using ‘rp.control()’ which is basically a list and also opens an empty GUI frame. We can use functions such as ‘rp.checkbox’ and ‘rp.slider’ to add elements to the GUI. Using these elements then does two things: an element of the list is changed (e.g., the element ‘xlim’), and a function is called on the list. This way, we can easily make an appropriate GUI element for each argument we need in a plotting function and make buttons that plot, save to PDF, etcetera. More information on 'rpanel' can be found in its Journal of Statistical Software article.